Phoenix Mercury center Brittney Griner would make one hell of a parole officer — at least in the case of an incarcerated Cleveland, Ohio, native who wrote a letter to the Ohio Parole Board asking to be freed from jail so that he can watch LeBron James play basketball this season. 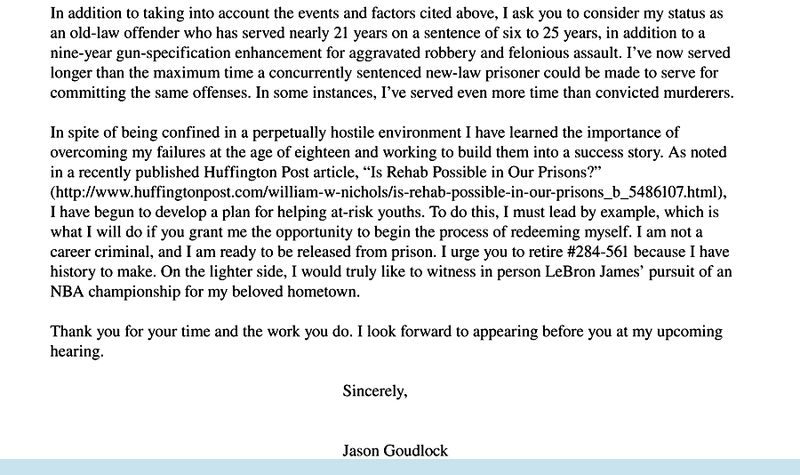 According to The Smoking Gun, 39-year-old Jason Goudlock is seeking the "opportunity to begin the process of redeeming myself" when he faces the Parole Board for the fourth time in a hearing later this month, adding that he has "begun to develop a plan for helping at-risk youths." Goudlock has been in jail for more than 20 years — since he was just 18 years old — for committing felony aggravated assault and robbery. "I would truly like to witness in person LeBron James' pursuit of an NBA championship for my beloved hometown," Goudlock wrote in his letter. But when asked by TMZ what she thought of the story, Griner laughed, calling the whole thing "crazy." "Get him a TV in his cell," the WNBA champ said. "Put a TV in his cell for him. That's crazy, if that's the reason [for parole]." But what if someone requested release from prison to watch her play? Griner left Goudlock with one final thought: "Don't do the crime if you can't pay the time," she said. Griner, for her part, has been described by her Mercury head coach Sandy Brodello as "tough as nails." She and her just swept the Chicago Sky in three games last month to secure the Mercury organization is third WNBA Championship. Griner missed the final game of the series after suffering a bloodied lip, a chipped tooth and a scratch across the eyelid in the previous game, but still managed to average 16.7 points and 6.0 rebounds per game in the playoffs.